Today marks the end of an era for the North Country Trail. For the almost 31 years since the NCT was authorized by Congress, we have had one National Park Service Manager, and that person is Tom Gilbert. Tom's involvement with our trail begins even earlier. In the 1970's, Tom helped author the initial study of the trail, which led to its authorization by Congress in 1980. 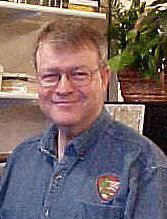 Tom also was instrumental in the development of the trail's 1982 Comprehensive Plan. It's probably safe to say that no one other person has had as much influence on the trail, both in its physical and philosophical routes. 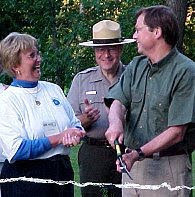 Tom's dedication, skills, accomplishments and depth of experience have earned the admiration of his peers throughout the National Trail System, as well as the appreciation and gratitude of a multitude of volunteers and partners along the North Country Trail. He is a friend to many of us who are in love with this trail. Today is my final day. Tomorrow I will be in the ranks of the retired. It was the dream of my life, beginning at age 12, to work for the National Park Service. The final 30 years of my federal career has been spent doing just that in a most interesting and challenging avenue--establishing and administering National Scenic and National Historic Trails. I have much to be thankful for. Mostly I am thankful for the many good colleagues, partners, and friends I have made and enjoyed over the years and the assistance and support they have given me. I have also enjoyed working for many good supervisors who have mentored me and shown confidence in me. I do not intend to leave my involvement with these trails "cold turkey." I will continue to be interested and involved, probably in a variety of volunteer roles, but will spend less time on trails so that I can expand my involvement in areas of life that have been waiting for my retirement. Tom has been gathering documentation for years about the origins of the North Country Trail. He has written the only known history of the trail, and presented a timeline of his findings at the Annual Conference in 2004. Perhaps a book is brewing? Perhaps he'll now have time to do more walking, instead of riding a desk? Whatever he does, we wish Tom well. We can only hope that our new manager will have half of Tom's dedication to the best interests of the North Country Trail.